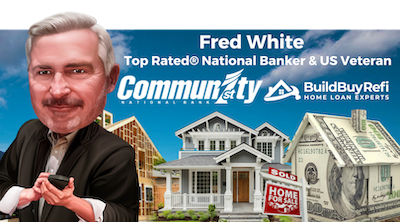 Fred is one of our Top Rated® National Bankers with Community First National Bank serving clients in all 50 states. He brings 33 yrs. of management experience including 29 yrs. in strategic finance, residential home, and construction lending. As a fellow Veteran, he has a genuine love for going the distance by helping Veterans and future homeowners experience nothing but success. After retiring from General Motors in 1989, Fred established White & Associates Consultants in 1992 which focused on operational reorganization of small businesses and Home sales centers with a focus on USDA, FHA, and VA home loan programs. Twenty-one years later while working at this same company, he would meet his now wife, Patti, who joined him on his journey in sharing the love of helping homeowners across the Midwest. Fred joined BuildBuyRefi.com and Community First National Bank with his Executive Assistant and wife, Patti in 2018 as one of our most valued Manufactured, Modular, and One-Time Close Construction experts. It is here that Fred can share his knowledge and fight even harder by reaching more clients across the country. Fred excels at working with clients on unique property and program types looking to obtain the best interest rates and loan programs available. He takes a thorough and systematic approach with clients that is rarely experienced by many of today’s industry professionals. Having weathered the storms of the housing crisis multiple times through his tenure, you'll have a hard time finding a nationwide expert with his level of experience, patience, and understanding. Fred and his wife Patti are members of the American Legion, Shriners, and USMC League, working with Veterans and Children’s organizations.